This is a perfect weekday meal that comes together quickly with just a little bit of planning. Chicken thighs are marinated during the day (or overnight) in a vinaigrette flavoured with curry powder, paprika, cinnamon and cayenne pepper. 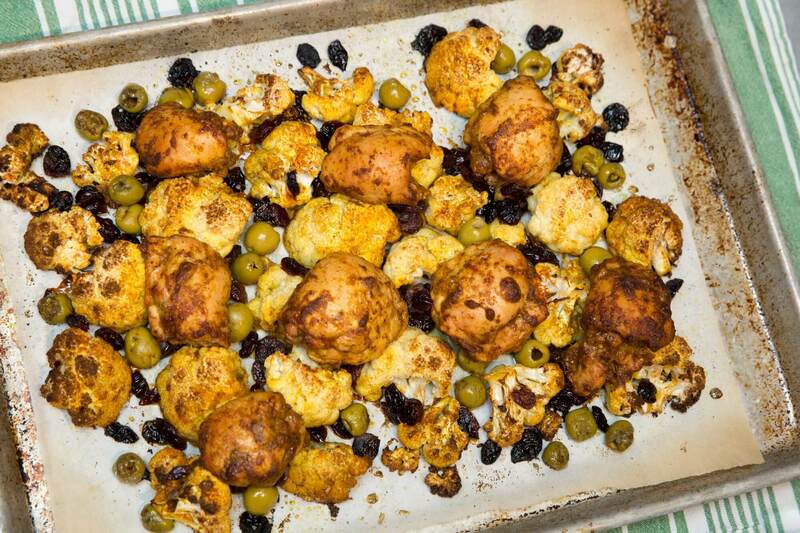 When it’s time for dinner, the cauliflower is tossed in oil, curry powder, paprika, salt. Add in the olives and, in my case, the rehydrated dried cranberries I used instead of dried apricots (any rehydrated dried fruit would work). Spread this into a single layer on a baking sheet. Add the chicken thighs on top (roll them back up to ensure they cook evenly and don’t burn around the edges). Serve with chipped cilantro and lemon wedges.